Dr Simon Lovestone is cycling 300 miles over 3 months, to raise funds for dementia research. He is cycling to Buckingham Palace today to receive his knighthood. Dr Simon Lovestone (pictured), an Oxford Health old age psychiatrist and a researcher at the NIHR Oxford Health Biomedical research centre, is cycling down to Buckingham palace today (07/12) to receive a knighthood for services to neuroscience research. 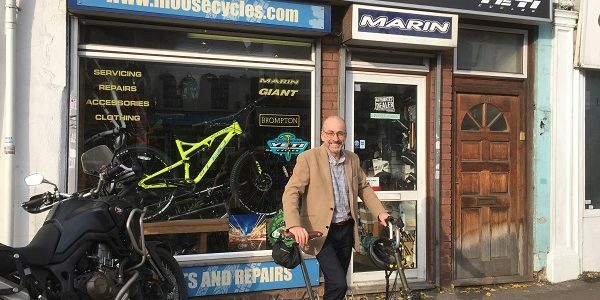 He chose the unusual mode of transportation because he is raising funds for the charity Alzheimer’s Research UK, by cycling 300 miles over three months. Dr Lovestone is a Professor at Oxford University’s Department of Psychiatry, and the informatics lead for the National Institute of Health Research (NIHR) Oxford Health Biomedical Research Centre, headquartered at Oxford’s Warneford Hospital. Besides being a working psychiatrist treating older people, Dr Lovestone’s research is aimed at finding effective treatments for Alzheimer’s Disease, and he is a Lead Academic Scientist at the Alzheimer’s Research UK Oxford Drug Discovery Institute. Earlier this year, Dr Lovestone was knighted in the Queen’s Birthday honours, and he will be formally receiving the knighthood from a member of the Royal family tomorrow at Buckingham Palace. Dr Lovestone and his colleagues at the NIHR Oxford Health BRC are aiming to cycle 300 miles apiece over 3 months, as part of the Alzheimer’s Research UK’s Cycling Down Dementia fundraising challenge. The charity specialises in finding ways to prevent, treat and cure dementia, and relies on donations to fund vital dementia research. Dr Lovestone said: “My research group and I spend all our working lives chasing down dementia – trying to understand this dreadful condition and find treatments to prevent it. So Cycling Down Dementia is a real pleasure and we are delighted to be helping to raise funds for research being done by brilliant scientists all over the UK.